Pseudomonas aeruginosa is a major cause of blindness and visual impairment in the United States and worldwide. Using a murine model of keratitis in which abraded corneas are infected with P. aeruginosa parent and ΔfliC (aflagellar) strains 19660 and PAO1, we found that F4/80+ macrophages were the predominant cell type in the cornea expressing TLR2, TLR4, and TLR5. Depletion of macrophages and dendritic cells using transgenic Mafia mice, in which Fas ligand is selectively activated in these cells, resulted in diminished cytokine production and cellular infiltration to the corneal stroma and unimpaired bacterial growth. TLR4−/− mice showed a similar phenotype postinfection with ΔfliC strains, whereas TLR4/5−/− mice were susceptible to corneal infection with parent strains. Bone marrow-derived macrophages stimulated with ΔfliC bacteria induced Toll/IL-1R intracellular domain (TIR)-containing adaptor inducing IFN-β (TRIF)-dependent phosphorylation of IFN regulatory factor 3 in addition to TIR-containing adaptor protein/MyD88-dependent phosphorylation of IκB and nuclear translocation of the p65 subunit of NFκB. Furthermore, TRIF−/− mice showed a similar phenotype as TLR4−/− mice in regulating only ΔfliC bacteria, whereas MyD88−/− mice were unable to clear parent or ΔfliC bacteria. Finally, IL-1R1−/− and IL-1α/β−/− mice were highly susceptible to infection. Taken together, these findings indicate that P. aeruginosa activates TLR4/5 on resident corneal macrophages, which signal through TRIF and TIR-containing adaptor protein/MyD88 pathways, leading to NF-κB translocation to the nucleus, transcription of CXCL1 and other CXC chemokines, recruitment of neutrophils to the corneal stroma, and subsequent bacterial killing and tissue damage. IL-1α and IL-1β are also produced, which activate an IL-1R1/MyD88-positive feedback loop in macrophages and IL-1R on other resident cells in the cornea. Pseudomonas aeruginosa is an important human pathogen, causing severe pulmonary disease, especially in patients with cystic fibrosis. However, P. aeruginosa is also a global cause of blindness and visual impairment. The major risk factors for P. aeruginosa keratitis include traumatic injury, pre-existing corneal abnormalities, and contact lens wear. As there are an estimated 140 million contact lens wearers worldwide, P. aeruginosa keratitis has an important clinical and economic impact (1–3). Disruption of the protective corneal epithelium facilitates P. aeruginosa invasion into the corneal stroma, although there is evidence that these organisms can penetrate the corneal epithelium (4). Once in the stroma, bacterial replication and the host response both contribute to loss of corneal transparency and development of corneal opacification. In addition, the P. aeruginosa Type III Secretion System has a role in corneal disease (5–7). Studies in our laboratory demonstrated that TLR activation of the abraded corneal surface results in rapid chemokine production, neutrophil and macrophage recruitment to the corneal stroma, and development of corneal haze (8–10). We also demonstrated that adaptor molecules MyD88 and Toll/IL-1R intracellular domain (TIR)-containing adaptor inducing IFN-β (TRIF) are functional in the cornea and that MyD88 has a novel inhibitory role in TLR3/TRIF activation (8, 9, 11). 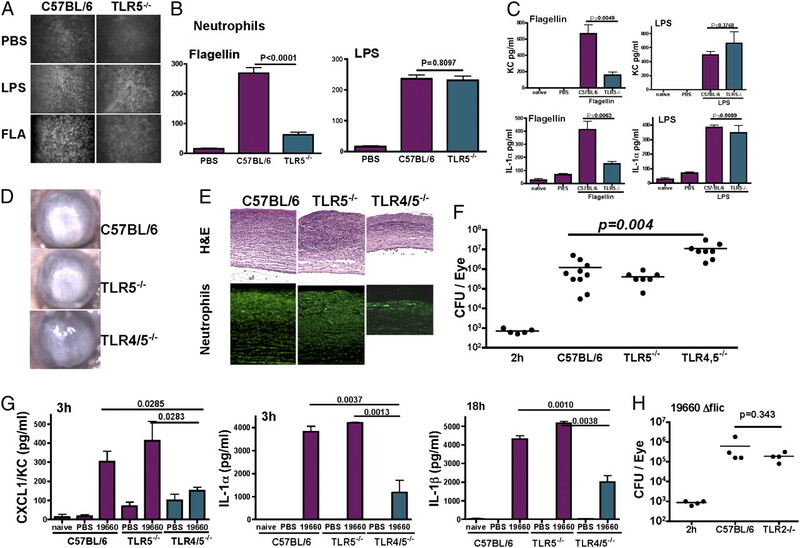 Although we and others reported that corneal epithelial cells respond to TLR ligands (9, 12–17), we showed that LPS/TLR4-induced corneal inflammation is also regulated by macrophages and dendritic cells (18). In the current study, we examined the role of macrophages and TLRs in a murine model of P. aeruginosa keratitis using parent (flagellar) and nonflagellar ΔfliC mutants of two P. aeruginosa strains described as having either cytotoxic (19660) or invasive (PAO1) properties in the cornea (19). 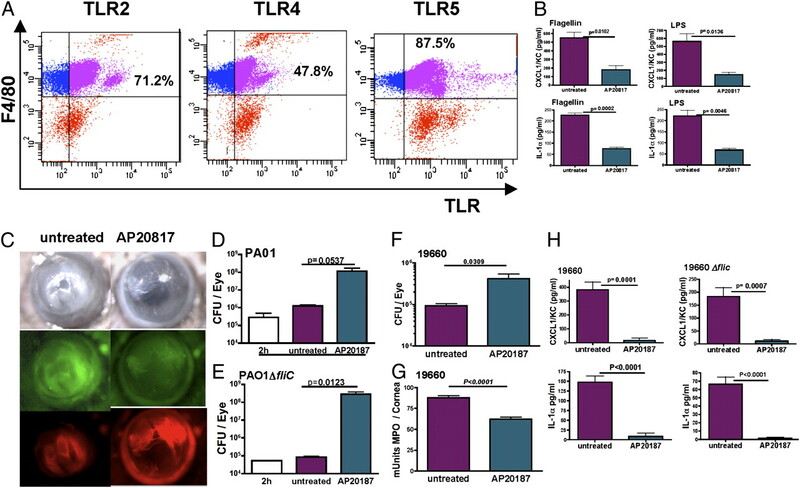 Our findings indicate that activation of TLR4 and TLR5 on corneal macrophages rapidly stimulates production of proinflammatory and chemotactic cytokines and cellular infiltration to the corneal stroma, which limit bacterial growth and survival. We also show that P. aeruginosa activates NF-κB in macrophages through both the TIR-containing adaptor protein (TIRAP)/MyD88 dependent and the TRIF-dependent pathways, and that IL-1α and IL-1β activation of IL-1R1 is an important feedback pathway in the host response to P. aeruginosa. P. aeruginosa strain 19660 was obtained from American Type Culture Collection (Manassas, VA), whereas strain PAO1 was maintained as stock. The fliC deletion constructs for both strains were generated by amplifying ∼500-bp flanking regions using primers fliC5-1 (5′-AAAAATCTAGACGCCGCGGCCGGCGCGCAGTT-3′), fliC5-2 (5′-AACTCGAGCCGCAAGCATGCTGAAGGCCATGGTGATTTCCT CCAAAG-3′), fliC3-1 (5′-TTCAGCATGCTTGCGGCTCGAGTTCGCTAAGCCCGGGAA CGGTCACT-3′), and fliC3-2 (5′-AAAAAAAGCTTCAAGCACCATGC CAAGTCGTTCAA-3′). The two flanking regions were spliced together by overlap extension PCR and cloned into the allelic exchange vector pEXG2 as an XbaI-HindIII fragment (20, 21). The vector was then delivered into P. aeruginosa by mating and generating a cointegrate, which was resolved by sucrose selection. Mutants that had retained the deletion were identified by loss of motility and confirmed by PCR. The complementing plasmid pP40-fliCp was generated by amplifying the fliC open reading frame and promoter region using primers fliC p-5R (5′-AAAAAGAATTCGCGTGCCCTGTTGCACGGG AGGGCT-3′) and fliC3H (5′-AAAAAAGCTTCGGGCTTAGCGCAGCAGGCTCA GGA-3′) and cloning the resulting PCR fragment into the promoterless shuttle-vector pPSV40 as an EcoRI/HindIII fragment (20). For infection studies, bacteria were grown in brain-heart infusion broth (BD Diagnostics, Sparks, MD) at 37°C for 18 h, and log-phase subculture was grown to an optic density of 0.200 (OD 650 nm, ∼1 × 108 CFU/ml). Bacteria were washed three times in PBS (HyClone, Logan, UT), centrifuged at 3000 rpm for 5 min, and resuspended in PBS. Dilution of the sample was made with PBS for the final inoculum. CFUs were quantified by plating track dilutions of the inoculum onto brain-heart infusion agar. C57BL/6,IL-1R1−/− mice and BALB/c and C.C3-TLR4Lps-d/J mice on a BALB/c background were purchased from The Jackson Laboratory (Bar Harbor, ME). TLR4−/−, MyD88−/−, and TRIF−/− mice were obtained with permission from Dr. S. Akira (Research Institute for Microbial Diseases, Osaka University, Japan), TIRAP−/− mice were obtained from Dr. R. Medzhitov, and TLR5−/− mice were obtained from Dr. Richard Flavell (both from the Howard Hughes Medical Institute, Yale University, New Haven, CT). Myeloid differentiation factor-2 (MD-2)−/− mice from K. Miyaki and IL-1α, β, and IL-1α/β mice were obtained from Dr. Y. Iwakura (both from the University of Tokyo, Tokyo, Japan). TLR4/5−/− mice were generated at Case Western Reserve University Animal Facility (Cleveland, OH), and Mafia mice were obtained from Dr. S. Burnett (University of Utah, Provo, UT). All animals were housed under specific pathogen-free conditions in microisolator cages and maintained according to institutional guidelines and the Association for Research in Vision and Ophthalmology Statement for the Use of Animals in Ophthalmic and Vision Research. Transgenic mice were generated by Burnett et al. (22) for inducible macrophage and dendritic cell depletion by macrophage Fas-induced apoptosis. The transgene is under control of the c-fms promoter that regulates expression of the CSF-1 receptor that is expressed on macrophages and dendritic cells. Mafia mice express eGFP and a membrane-bound suicide protein made up of the human low-affinity nerve growth factor receptor, the FK506-binding protein, and a cytoplasmic domain of Fas (22, 23). AP20187 is a covalently linked dimer (Ariad Pharmaceuticals, Cambridge, MA) that cross-links the FK506-binding protein region of the suicide protein and induces caspase 8-dependent apoptosis as described previously. These mice are on a C57BL/6 background and have a normal phenotype in the absence of the dimerizer. Cells from C57BL/6TgN (ACTbEGFP)10sb (eGFP) mice or eGFP mice crossed with TLR4−/− were isolated as described previously (24). Following euthanasia by CO2 asphyxiation, femurs and tibias were removed, and the shafts were centrifuged at 10,000 rpm for 30 s at 4°C. The pellet was resuspended in 1 ml sterile RBC lysis buffer for 2–3 min, and cells were centrifuged at 1200 rpm for 5 min at room temperature and then washed once using sterile DMEM. Recipient mice received 2 × 600-Gy doses of whole-body irradiation 3 h apart. Immediately following the second dose, mice were injected i.v. with 200 μl DMEM containing 5 × 106 bone marrow cells. The presence of eGFP+ cells in the blood and in the cornea indicated successful transplant. Mice were anesthetized by i.p. injection of 0.4 ml 2,2,2-tribromoethanol (1.2%). Central corneas were scarified with three parallel 1 mm in length abrasions using a 26-gauge needle. A 5-μl aliquot containing ∼5 μl bacterial suspension was applied to the scarified cornea. Sterile PBS was applied to the abraded cornea as a trauma control. A sterile trephine (Miltex, Tuttlingen, Germany) was used to generate a 2-mm-diameter punch of silicone hydrogel contact lens (Night and Day; CIBA Vision, Duluth, GA), which was placed over the central cornea to maintain placement of the bacterial suspension. The contact lenses were removed after 2 h, and mice were allowed to recover from the anesthesia. Whole eyes were homogenized under sterile conditions using the Mixer Mill MM300 (Retsch, Newtown, PA) at 33 Hz for 4 min. Serial log dilutions were performed and plated onto Brain-Heart Infusion Agar (BD Diagnostics). Plates were incubated at 37°C for 18 h, and the number of CFUs was determined by direct counting. In vivo analysis of the corneal infiltration was evaluated using the ConfoScan3 microscope system (Nidek Technologies, Fremont, CA) as described in our previous studies (8, 25). Transparent gel (Genteal; Novartis Ophthalmics, Duluth, GA) was applied at the interface of the cornea and objective, and corneas were examined using a ×40 objective. The software (NAVIS; Lucent Technologies, Murray Hill, NJ) was used to capture sequential images of the entire cornea. Eyes from control and infected mice were enucleated and placed in 10% formalin/PBS 5 μm corneal sections were prepared, and H&E staining was performed using Gill’s hematoxylin for 3–5 min following deparaffinization. The slides were dipped into glacial acetic acid solution, placed in Shandon Bluing Solution (Thermo Shandon, Pittsburgh, PA), and counterstained with alcohol Eosin Y solution (Thermo Shandon). The slides were then dehydrated and mounted under Permount medium (Vector Laboratories, Burlingame, CA). To detect neutrophils in the corneal stroma after stimulation with LPS or flagellin, eyes were snap frozen, and 5-μm sections were incubated with primary rat anti-mouse neutrophil (NIMP-R14; Abcam, Cambridge, MA) as described previously (25). Briefly, Abs were diluted 1/100 in 1% FCS-TBS 2 h at room temperature. Sections were washed and incubated with FITC-conjugated rabbit anti-rat Ab (Vector Laboratories) diluted 1/200 in 1% FCS-TBS for 45 min. Neutrophils in the corneal stroma were enumerated directly using fluorescence microscopy (magnification ×40) (Olympus Optical, Tokyo, Japan). Corneas were dissected and homogenized in tissue lyser in 200 μl/cornea 0.5% hydratropic acid-Br buffer and 10 mM N-ethylmaleimide (Sigma-Aldrich, St. Louis, MO). The reaction mixture was prepared according to manufacturer’s directions (Cell Technology, Mountain View, CA), and samples were assayed along with myeloperoxidase (MPO) standards. After 30 min of incubation in the dark, reactivity was measured using a fluorescent plate reader, and values were calculated as units of MPO activity. Corneas were excised using a 2-mm trephine, residual iris material was removed, and corneas were homogenized using a Mixer Mill MM300 (Retsch, Haan, Germany) for 4 min at 30 Hertz/s. After centrifugation, cytokine levels in supernatants were determined by sandwich ELISA, according to manufacturer’s directions (R&D Systems, Minneapolis, MN). Absorption was measured at 450 nm on a VersaMax microplate reader using using SoftMaxPro software 5.2 (Molecular Devices, Sunnyvale, CA). Corneas were excised, and residual iris material was removed as described above. Five corneas were pooled, minced using a scalpel, and incubated in 500 μl collagenase type I (Sigma-Aldrich) at ∼82 U/cornea for 1.5 h at 37°C. Cell suspensions were filtered and washed with 3 ml FACS buffer (1× PBS without Ca2+ or Mg2+, 1% FBS, and 0.1% sodium azide). Cells were centrifuged and resuspended in 2 ml FACS buffer containing 20 μg Fc blocking Ab (anti-mouse CD16/32; eBioscience, San Diego, CA) and incubated on ice for 10 min. After blocking, the corneal cells were then distributed into 100 μl samples and stained with the following Abs: neutrophil marker NIMP-14-Alexa Fluor 488 (in house, 0.5 μg/106 cells), macrophage marker CD11b-PE (1 μg/106 cells; eBioscience), F4/80-PE-Cy5 (0.3 μg/106 cells; eBioscience), dendritic cell marker CD11c-efluorTM450 (0.5 μg/106 cells; eBioscience), TLR2-Alexa Fluor 647 (0.5 μg/106 cells; eBioscience), TLR4-allophycocyanin (0.5 μg/106 cells; eBioscience), and TLR5-FITC (1 μg/sample; Abcam, Cambridge, MA); or with isotype controls efluorTM450-Armenian Hamster IgG (0.5 μg/sample; eBioscience), PE-rat IgG2b (1 μg/sample; eBioscience), allophycocyanin-rat IgG2a (0.5 μg/sample; R&D Systems), and Alexa Fluor 647-rat IgG2b (0.5 μg/sample; eBioscience). Each cell type was also stained with the nucleic acid dye 7-aminoactinomycin D (7-AAD) (eBioscience) to access cell viability, because dead or dying cells with a compromised plasma membrane cannot exclude 7-AAD. Furthermore, 7-AAD fluoresces in the far-red range of the spectrum and can be used with PE-stained cells without spectral overlap. Cells were stained for 30 min on ice and then washed with 4 ml FACS buffer and resuspended in 0.5% formaldehyde. Cell profiles were acquired on a BD LSRII flow cytometer the following day. Cells were gated on forward versus side scatter, then cells positive for cell type markers (F4/80, NIMP-14, CD11b, and CD11c) were gated based on isotype marker or unstained cell sample. Gates were set either using the histogram or dot-plot graph, depending on which representation showed clear positive results. The percentage of cells positive for TLR5, TLR2, or TLR4 was then calculated for each cell type using the population hierarchy. Flow cytometric analysis was performed using BD FACSDiva software. Bone marrow cells were derived from 6- to 8-wk-old C57BL/6 mice as described above for development of chimeras. Cells were incubated in DMEM containing 10% FBS and 30% L929-conditioned medium for 10 d to differentiate them to macrophages (9). These cells were then counted and incubated and stimulated with either LPS (100 ng/ml), or P. aeruginosa 19660 parent strain or ΔfliC at a multiplicity of 100 for the indicated times. The bacteria used for stimulation were killed in 0.3% tobramycin solution as described previously (25). After treatment, the cells were washed in ice-cold PBS and lysed in 1× lysis buffer (Cell Signaling Technology, Beverly, MA). Protein was quantified using standard BCA technique, and equal quantity of protein was fractionated in 10% SDS polyacrylamide gel. The protein was then transferred onto nitrocellulose membrane and probed using the following primary Abs: phosphorylated (P)-IκBα, P-IFN regulatory factor 3 (IRF3), total IκBα, and β-actin (Cell Signaling Technology) in 1/1000 dilutions in 5% BSA. HRP-conjugated secondary Ab was used and developed with Pierce SuperSignal Femto ECL. To detect NF-κB nuclear translocation, 5 × 104 bone marrow-derived macrophages were cultured on sterile coverslips in 24-well plates and treated with LPS (100 ng/ml), 19660 (multiplicity of infection 100) or 19660ΔfliC (multiplicity of infection 100) for 15, 30, and 60 min. Following activation, the cells were fixed with 4% paraformaldehyde for 15 min at room temperature. Fixed cells were permeabilized with 0.1% Triton X-100 in PBS for 1 min at room temperature and incubated with rabbit anti-mouse p65 (1/100; eBioscience) in PBS containing 10% goat serum for 1 h at room temperature. Coverslips were washed twice with PBS and incubated with Alexa Fluor 488-labeled goat anti-rabbit IgG Ab (Molecular Probes) in PBS at room temperature for 1 h and washed with PBS, and placed on glass slides using Vectashield mounting medium with DAPI (Vector Laboratories U.K., Peterborough, U.K.). Images were captured on a Leica DMI 6000 B inverted microscope using a ×40 objective connected to a Retiga EXI camera (Q-imaging, Vancouver, British Columbia, Canada). Student t test or ANOVA with Tukey post hoc analysis (GraphPad Prism, San Diego, CA), and statistical significance was defined as p < 0.05. To determine which cells in the cornea express TLR2, TLR4, and TLR5 during infection with P. aeruginosa, corneas of C57BL/6 mice were abraded, 1 × 105 CFU 19660 were added topically, and a 2-mm-diameter punch from a silicone hydrogel contact lens was placed on the corneal surface for 2 h to maintain contact between the bacteria and the ocular surface. Corneas were dissected and homogenized 18 h postinfection, and a single-cell suspension was incubated with fluorescent-tagged F4/80 (macrophages) or with Abs to CD11c (dendritic cells) or NIMP R14 (neutrophils). Cells were also incubated with Abs to TLR2, TLR4, or TLR5, or with isotype controls, and examined by flow cytometry. Dead cells were identified using 7-AAD and were gated out of the population, and positive cell populations were gated according to the specific isotype control. In a representative experiment (Fig. 1A), 71.2% F4/80+ cells expressed TLR2, 47.8% expressed surface TLR4, and 87.5% expressed TLR5. In contrast, <10% NIMPR14+ neutrophils expressed TLR2, TLR4, or TLR5, and as <4% of total cells were CD11c+, TLR expression could not be assessed (data not shown). We also found that CD11b Abs stained the same population of cells as F4/80+ macrophages (data not shown) and that there was an additional population of TLR-expressing cells that were F4/80 negative (Fig. 1A) and were also negative for CD11b, CD11c, and NIMP-R14 (data not shown). These cell populations might include resident corneal fibroblasts or epithelial cells. Overall, these data show that F4/80+ macrophages are the predominant cell population that expresses TLR2, TLR4, and TLR5 in the cornea during P. aeruginosa keratitis. Role of macrophages in P. aeruginosa keratitis. A, Corneas of C57BL/6 mice were infected with 1 × 103 PA19660. After 18 h, corneas were pooled from five mice and treated with collagenase, and cells were incubated with F4/80 and with Abs to TLRs and examined by flow cytometry. F4/80+ cells are shown with relative expression of TLR2, TLR4, and TLR5. In a repeat experiment, the percentage of F4/80+ cells that were TLR2+, TLR4+, and TLR5+ cells were 73.6, 41.2, and 82.4, respectively. B–H, Mafia mice were treated with AP20817, which depletes macrophages and dendritic cells, and corneas were either stimulated with purified LPS or flagellin or infected with P. aeruginosa 19660 or PAO1 flagellin-expressing strains or ΔfliC mutants. B, CXCL1/KC and IL-1α from corneas 3 h after stimulation with flagellin or LPS. C, Representative corneas of AP20817 or untreated Mafia mice 24 h postinfection with PAO1 expressing mCherry. Eyes were examined by bright-field microscopy (upper panels) and by fluorescence to visualize infiltrating eGFP+ macrophages and dendritic cells (central panels) or mCherry expressing PAO1 (lower panels) (original magnification ×20). D and E, CFUs 24 h postinfection with PAO1 (D) or PAO1ΔfliC (E). F and G, Mice were infected with strain 19660, and CFUs (F) and MPO production (G) were measured 24 h postinfection. H, CXCL1/KC and IL-1α in corneas 3 h postinfection with 19660 or 19660ΔfliC. Data in B and D–H are mean ± SEM of five mice per experiment. Similar results were found in three repeat experiments. We recently reported that LPS-induced corneal inflammation is dependent on macrophages (18). To determine if macrophages also regulate TLR5-induced corneal inflammation, corneas of transgenic Mafia mice were abraded, flagellin was added topically, and cytokine production was examined after 3 h, which is prior to neutrophil recruitment to the corneal stroma after exposure to LPS (8, 10, 26). Mafia mice express a genomic construct that comprises a membrane-bound suicide receptor with a cytoplasmic Fas domain under control of a c-fms promoter in macrophages and dendritic cell populations and which undergo apoptosis upon AP20817-mediated dimerization of the FK-binding protein (18, 22). As shown in Fig. 1B, flagellin stimulated CXCL1 and IL-1α production in the corneas of untreated mice, whereas cytokine production was completely ablated in AP20817-treated mice. Similar results are shown for LPS. To examine the role of c-fms+ cells in P. aeruginosa keratitis, corneas of untreated and AP20817-treated Mafia mice (c-fms cells) were abraded and infected with P. aeruginosa strain PAO1 expressing the red fluorescent protein mCherry. After 24 h, corneas were examined by bright-field microscopy for corneal opacification and by fluorescent microscopy to detect eGFP+ (c-fms+) cells and mCherry-expressing bacteria. As shown in Fig. 1C, corneal opacification was apparent within 24 h of infection, and there was a pronounced infiltrate of c-fms+,eGFP+ cells in untreated mice, with mCherry-expressing P. aeruginosa localized to the central region of the cornea (site of inoculation). In marked contrast, AP20817-treated Mafia mice had less corneal opacification, eGFP+ cells were not detected, and mCherry+ bacteria were present throughout the cornea, indicating impaired cellular infiltration and bacterial clearance. Quantification of CFUs showed a significantly higher bacterial load in AP20817-treated (cfms+ cell depleted) mice compared with normal Mafia mice postinfection with either PAO1 or PAO1ΔfliC (Fig. 1D, 1E). Similarly, AP20817-treated Mafia mice infected with 19660 had significantly higher CFUs than untreated Mafia mice (Fig. 1F). To examine the role of macrophages in neutrophil infiltration to the cornea during P. aeruginosa keratitis, corneas were dissected 24 h postinfection, and MPO production was measured. Fig. 1G shows significantly lower MPO levels in AP20817-treated Mafia mice compared with untreated Mafia mice. We also measured cytokine production in the cornea 3 h postinfection with 19660. As shown in Fig. 1H, P. aeruginosa-induced CXCL1 and IL-1α production was completely ablated in AP20817-treated Mafia mice. Taken together, these findings demonstrate that c-fms+ cells regulate early cytokine and chemokine production and subsequent neutrophil recruitment to the corneal stroma and inhibition of bacterial growth and survival. To determine the role of TLR4 in P. aeruginosa keratitis, corneas of TLR4−/− mice, TLR4Lps-d mice (which have a point mutation in TLR4), and mice deficient in the TLR4 coreceptor MD-2 (27) were abraded and infected with parent, ΔfliC 19660, or PAO1 strains. Fig. 2A–D shows that CFUs recovered from mice with mutations in TLR4 or MD-2 were significantly elevated postinfection with aflagellar mutants 19660ΔfliC or PAO1ΔfliC when compared with control C57BL/6 or BALB/c mice. In contrast, there was no significant difference in CFUs between control mice and TLR4−/−, MD-2−/−, or TLR4Lps-d infected with 19660 or PAO1 (expressing flagellin) (Fig. 2E–H). Consistent with elevated CFUs in TLR4−/− mice, ΔfliC-infected corneas had less corneal opacification (Fig. 2I) and neutrophil infiltration (Fig. 2J). Role of TLR4 and MD-2 in P. aeruginosa keratitis. Corneas of C57BL/6, TLR4−/−, MD-2−/−, BALB/c, and TLR4Lps-d mice were abraded and infected with either 1 × 105 PAO1 or PAO1ΔfliC or with 1 × 103 19660 or 19660ΔfliC. After 24 and 48 h, total CFUs per eye were assessed. A–D, CFUs from mice infected with ΔfliC strains; E–H, CFUs from mice infected with parent strains. I and J, Representative C57BL/6 and TLR4−/− eyes on day 1 postinfection with 19660ΔfliC showing corneal opacification (I) and cellular infiltration (J). I, Original magnification ×20. J, Sections were either stained with H&E (left panels) or immunostained with NIMP-R14 to detect neutrophils (right panels). Original magnification ×400. K, Corneas were dissected and homogenized 3 h postinfection with 1 × 103 19660ΔfliC, and CXCL1/KC and IL-1α were measured by ELISA. L and M, Bone marrow chimera mice were generated using donor C57BL/6/eGFP+ or TLR4−/−/eGFP+ bone marrow cells to reconstitute irradiated C57BL/6 recipients. Corneas were infected with 1 × 103 19660ΔfliC, and CFUs were examined after 48 h (L). M, Representative corneas with infiltrating eGFP+ cells. Data in A–H and K are mean ± SEM of five corneas per group; data points in L represent individual corneas. Each experimental condition was repeated at least twice with similar results. ac, anterior chamber; epi, corneal epithelium; Inoc, inoculum. To ascertain whether TLR4 regulates early production of proinflammatory and chemotactic cytokines, corneas of infected C57BL/6 and TLR4−/− mice were dissected 3 h after inoculation with 19660ΔfliC and homogenized, and cytokine concentration was measured by ELISA. Fig. 2K shows that CXCL1/KC and IL-1α were elevated in infected corneas compared with trauma controls at this time point; however, production of both cytokines was significantly lower in infected TLR4−/− compared with C57BL/6 corneas. Because TLR4 is expressed on F4/80+ corneal macrophages during infection, we generated bone marrow chimeras using lethally irradiated C57BL/6 mice as recipients and donor bone marrow cells from eGFP+TLR4−/− or eGFP+ C57BL/6 mice. Four weeks after reconstitution, corneas were infected with 1 × 103 19660ΔfliC, and bacterial recovery was assessed after 48 h. Fig. 2L shows significantly higher CFUs in C57BL/6 recipient mice given TLR4−/− donor cells compared with mice given C57BL/6 donor cells and, conversely, fewer eGFP+ cells in the corneas of mice given TLR4−/− bone marrow cells (Fig. 2M). Together, these findings demonstrate that, in the absence of flagellin, TLR4 on bone marrow derived cells regulates cytokine production, cellular infiltration, and bacterial growth in P. aeruginosa keratitis. To determine whether TLR5 activation induces an inflammatory response in the cornea, we abraded the corneal surface of C57BL/6 and TLR5−/− mice, stimulated the corneal surface with LPS or flagellin, and examined cellular infiltration to the corneal stroma by in vivo confocal microscopy and quantification of neutrophils in corneal sections. As shown in Fig. 3A, LPS induced a pronounced cellular infiltration compared with trauma (PBS) controls in C57BL/6 and TLR5−/− corneas, which are both strains, detectable as small, highly refractive cells in the corneal stroma. In contrast, cellular infiltration was detected in flagellin-treated C57BL/6 but not TLR5−/− corneas. Similarly, flagellin induced neutrophil recruitment to the corneal stroma of C57BL/6 but not TLR5−/− mice, whereas there was no difference in neutrophil numbers between LPS-stimulated C57BL/6 and TLR5−/− corneas (Fig. 3B). Cytokine production in the cornea also showed ligand specificity (Fig. 3C), with significantly reduced CXCL1/KC and IL-1α in TLR5−/− corneas after stimulation with flagellin. Taken together, these observations clearly demonstrate that flagellin induces TLR5-dependent corneal inflammation. 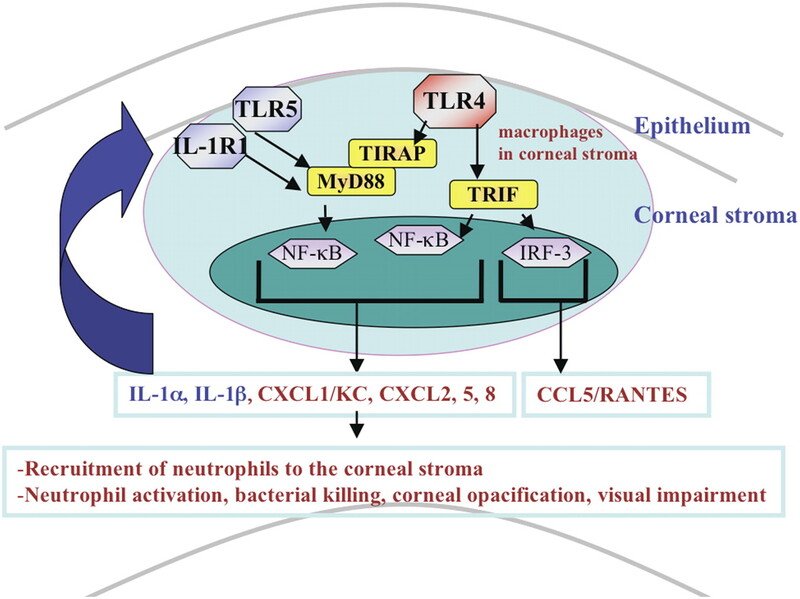 Role of TLR5 in corneal inflammation and P. aeruginosa keratitis. A–C, Corneas of C57BL/6 and TLR5−/− mice were abraded and treated with LPS or flagellin. A, Representative 24-h images of the central corneal stroma captured using in vivo confocal microscopy. Infiltrating cells are highly reflective (original magnification ×200). B, Neutrophil numbers per 5-μm corneal section 24 h after exposure to LPS or flagellin. C, CXCL1/KC and IL-1α production in corneas 3 h after exposure to LPS or flagellin. D–G, Corneas of C57BL/6, TLR5−/−, and TLR4/5−/− mice were infected with 1 × 103 19660. D, Representative eyes with corneal opacification 24 h postinfection (original magnification ×20); E, H&E and neutrophil staining after 24 h (original magnification ×400); F, CFUs after 24 h; and G, CXCL1/KC and IL-1α production in corneas 3 h postinfection and IL-1β production in corneas 18 h postinfection. H, CFUs in TLR2-/- mice are infected with ΔfliC 19660. Data in B, C, and G are mean ± SEM of five corneas per group; data points in F and H represent individual corneas. Each experiment was repeated at least twice with similar results. To determine the role of TLR5 in P. aeruginosa keratitis, corneas of C57BL/6, TLR5−/−, and TLR4/5−/− mice were abraded and infected with 1 × 103 19660 (expressing flagella), and CFUs were quantified after 48 h. As shown in Fig. 3D, corneal opacification was lower in TLR4/5−/− mice compared with C57BL/6 and TLR5−/− mice. Consistent with this observation, TLR4/5−/− mice had impaired neutrophil infiltration to the corneal stroma compared with C57BL/6 and TLR5−/− mice (Fig. 3E). Furthermore, bacterial recovery was significantly elevated in TLR4/5−/− mice compared with C57BL/6 or TLR5−/− mice (Fig. 3F), indicating impaired bacterial killing in the double knockout mice. To examine the role of TLR4 and TLR5 in cytokine production, C57BL/6, TLR5−/−, and TLR4/5−/− corneas were dissected 3 or 18 h postinfection with PA19660, and cytokines were measured by ELISA. As shown in Fig. 3G, CXCL1 and IL-1α production were elevated in C57BL/6 and TLR5−/− corneas at 3 h postinfection, and IL-1β production was elevated in both mouse strains at 18 h postinfection; however, production of each of these cytokines was significantly lower in corneas from infected TLR4/5−/− mice. Given that TLR2 is expressed on corneal macrophages (Fig. 1A), TLR2 ligands induce an inflammatory response in the cornea (8), and TLR2 has a regulatory role in P. aeruginosa lung infections (28, 29), we also examined the role of TLR2 in P. aeruginosa keratitis. C57BL/6 and TLR2−/− corneas were infected with 19660ΔfliC, and CFUs were quantified as before. There was no significant difference in CFU recovery between TLR2−/− and C57BL/6 mice on day 1 (Fig. 3H) or day 2 postinfection or on cellular infiltration (data not shown), indicating that there is no role for this receptor in P. aeruginosa keratitis. Taken together with results from Fig. 2, these findings indicate that the host response in the cornea to flagella-expressing P. aeruginosa can be initiated by either TLR4 or TLR5, because the absence of both receptors is required to inhibit cytokine production, neutrophil infiltration, and bacterial killing. Having shown that corneal macrophages express TLR4 and TLR5 and that c-fms+ macrophages, dendritic cells, and TLR4+ donor bone marrow cells regulate P. aeruginosa growth in the cornea, we next examined the role of TIR containing adaptor molecules in TLR4 activation of bone marrow-derived macrophages. TLR4 is the only member of this receptor family that uses the TRIF pathway in addition to the MyD88 signaling pathway (30, 31) and also requires MyD88 adaptor-like/TIRAP to recruit MyD88 to the TIR domain of the receptor (32–34). We therefore derived macrophages from bone marrow cells isolated from C57BL/6, MyD88−/−, TIRAP−/−, and TRIF−/− mice, stimulated the cells with antibiotic-killed P. aeruginosa 19660 or 19660ΔfliC or with LPS, and measured NF-κB p65 translocation to the nucleus, IκB, and IRF3 phosphorylation and cytokine production. Fig. 4A shows NF-κB p65 translocation in C57BL/6 macrophages incubated 15 min with 19660 ΔfliC, whereas p65 remained in the cytoplasm in TIRAP−/− and MyD88−/− macrophages and was not detected in the nucleus until 60 min after stimulation. Macrophages from TRIF−/− and IL-1R1−/− mice had the same time course of p65 translocation as C57BL/6 macrophages. Similar results were found after LPS stimulation (data not shown). CXCL1/KC production, which is dependent on NF-κB, was also inhibited in TIRAP−/− and MyD88−/− macrophages (Fig. 4B). Conversely, CCL5/RANTES, which is dependent on the TRIF pathway (35, 36), was inhibited in TRIF−/− but not TIRAP−/− or MyD88−/− bone marrow macrophages (Fig. 4B). Role of adaptor molecules and IL-1R1 in P. aeruginosa activated macrophages. Macrophages were derived from bone marrow cells isolated from C57BL/6, TIRAP−/−MyD88−/−, TRIF−/−, and IL-1R1−/− mice and stimulated with LPS or with antibiotic killed 19660 or 19660ΔfliC. A, Representative wells showing translocation of NF-κB to the nucleus. Macrophages were incubated with killed 19660ΔfliC, and at indicated time points, cells were fixed and immunostained with Ab to the p65 subunit of NF-κB. Data are indicative of two repeat experiments with triplicate wells. B, CXCL1/KC and CCL5/RANTES production by bone marrow macrophages stimulated 3 h with 19660ΔfliC. C, Bone marrow macrophages were incubated with LPS, 19660, or 19660ΔfliC. At indicated times, cells were harvested and processed for Western blot analysis using Abs to P-IκB, P-IRF3, and β-actin. Bone marrow-derived macrophages were also processed for Western blot analysis to detect P-IκB and IRF3. As shown in Fig. 4C, left panels, P-IκB was detected in C57BL/6 macrophages 15 min after stimulation with LPS, 19660, or 19660Δflic and remained elevated at 60 min. However, consistent with p65 translocation, TIRAP−/− and MyD88−/− macrophages stimulated with LPS or 19660ΔfliC had delayed Iκb phosphorylation compared with C57BL/6 macrophages (Fig. 4C). The time course of Iκb phosphoryation in TRIF−/− and IL-1R1−/− macrophages was similar to C57BL/6 macrophages. To determine whether the TRIF pathway is activated, IRF3 phosphorylation was measured in C57BL/6 and TRIF−/− macrophages. Fig. 4C, center panels, shows that in C57BL/6 mice P-IRF3 was detected 30 or 60 min after incubation with LPS, 19660, or 19660ΔfliC. Although there was no difference in the time course of IRF3 phosphorylation in TIRAP−/−, MyD88−/−, and IL-1R1−/− macrophages, there was no detectable P-IRF3 in TRIF−/− macrophages. Together, these findings demonstrate that P. aeruginosa activates both the TIRAP/MyD88-dependent and TRIF-dependent (MyD88-independent) pathways in bone marrow macrophages and indicate that they use the same pathways in bone marrow-derived macrophages in the cornea. Given that P. aeruginosa activates TRIF, MyD88, and TIRAP in bone marrow macrophages, we next examined the role of these adaptor molecules in P. aeruginosa keratitis. 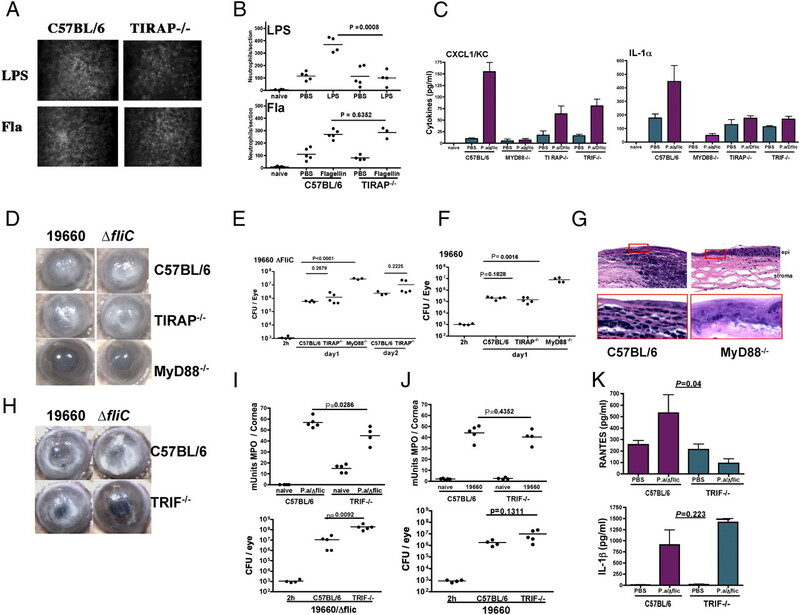 To determine whether TIRAP is required for LPS-induced corneal inflammation, corneas of C57BL/6 and TIRAP−/− mice were abraded and stimulated with either LPS or flagellin. After 24 h, cellular infiltration to the corneal stroma was visualized by in vivo confocal microscopy, and neutrophils in the cornea were quantified by immunohistochemistry. Fig. 5A shows a cellular infiltrate in the central corneal stroma of LPS-treated C57BL/6 but not TIRAP−/− corneas, whereas there was no difference in cellular infiltration in mice treated with flagellin. Similarly, LPS induced neutrophil recruitment to the corneal stroma of C57BL/6 but not TIRAP−/− mice, whereas there was no difference in flagellin stimulated corneas (Fig. 5B), thereby demonstrating an essential role for TIRAP in LPS/TLR4 corneal inflammation. Role of TRIF, TIRAP, and MyD88 in P.aeruginosa keratitis. A, Representative in vivo confocal microscopy of C57BL/6 and TIRAP−/− mice showing light refractive cells in the central corneal stroma 24 h after stimulation with LPS or flagellin (Fla) (original magnification ×200). B, Neutrophils/5-μm corneal sections of C57BL/6 and TIRAP−/− mice at the same time point. C, Cytokine production in corneas 3 h postinfection with 1 × 103 19660ΔfliC. D, Representative C57BL/6, TIRAP−/−, and MyD88−/− corneas 1 day postinfection. E and F, CFUs from C57BL/6, TIRAP−/−, and MyD88−/− mice infected with either 19660ΔfliC (E) or with 19660 (F). G, Representative histological sections of C57BL/6 and MyD88−/− corneas 24 h postinfection with 19660 showing impaired cellular infiltration in MyD88−/− corneas. At higher magnification, bacteria can be detected in the basal epithelium and anterior stroma. Original magnification ×400 (upper panels); ×1000 (lower panels). H, Representative corneas of C57BL/6 and TRIF−/− mice 24 h after corneal infection with 1 × 103 19660 ΔfliC. I and J, MPO and CFUs from C57BL/6 and TRIF−/− mice infected with 19660ΔfliC (I) or 19660 (J). K, CCL5/RANTES and IL-1β production in C57BL/6 and TRIF−/− corneas 18 h postinfection with 19660ΔfliC. D and H, Original magnification ×20. Data in C and K are mean ± SEM of five corneas per group. Data points in B, E, F, I, and J represent individual corneas; experiments were repeated three times with similar results. epi, corneal epithelium. To determine if these adaptor molecules regulate P. aeruginosa-induced cytokine production, corneas of C57BL/6, MyD88−/−, TIRAP−/−, and TRIF−/− mice were infected with 1 × 103 19660 ΔfliC, and cytokine production was measured after 3 h. As shown in Fig. 5C, CXCL1 and IL-1α were elevated in P. aeruginosa-infected C57BL/6 corneas compared with trauma controls. However, cytokine production was completely ablated in MyD88−/− corneas and was significantly reduced in TIRAP−/− and TRIF−/− compared with infected C57BL/6 corneas. These findings are consistent with data shown in Fig. 4 for bone marrow macrophages in vitro and indicate that all of these adaptor molecules are required for early cytokine production in the cornea. To determine the role of the TIRAP/MyD88 pathway on the outcome of P. aeruginosa keratitis, corneas of C57BL/6, MyD88−/−, and TIRAP−/− mice were infected with 1 × 103 19660 or 19660 ΔfliC, and cellular infiltration, CFUs, and corneal opacification were examined as before. As shown in Fig. 5D, there was no difference in corneal opacification between C57BL/6 and TIRAP−/− mice after 48 h, whereas MyD88−/− had less disease. Consistent with this observation, there was no significant difference in CFUs between C57BL/6 and TIRAP−/− mice infected with either 19660 or 19660 ΔfliC, whereas CFUs recovered from MyD88−/− mice were significantly elevated postinfection with either strain (Fig. 5E, 5F). Cellular infiltration to MyD88−/− corneas was diminished compared with C57BL/6 mice (Fig. 5G), and bacteria were detected in the anterior corneal stroma of MyD88−/− mice but not control mice. There was no significant difference in MPO production or cellular infiltration between C57BL/6 and TIRAP−/− corneas (data not shown). To examine the role of TRIF in P. aeruginosa keratitis, C57BL/6 and TRIF−/− mice were infected with 1 × 103 19660ΔfliC. As shown in Fig. 5H, corneal opacification was decreased in TRIF−/− compared with C57BL/6 corneas. Similarly, MPO production was significantly lower in TRIF−/− mice, and CFUs were significantly higher compared with C57BL/6 corneas infected with 19660 ΔfliC (Fig. 5I). In contrast, there were no differences in MPO or CFUs between TRIF−/− and C57BL/6 mice infected with 19660 (Fig. 5J). As CCL5/RANTES production is TRIF-dependent (Fig. 4B) (36), we also measured this cytokine in TRIF−/− corneas at 18 h postinfection. As shown in Fig. 5K, CCL5 was elevated in infected C57BL/6 corneas compared with trauma controls and was significantly reduced in TRIF−/− corneas. There was no difference in IL-1β production between infected C57BL/6 and TRIF−/− corneas (Fig. 5K). In summary, these data show that TIRAP, MyD88, and TRIF all contribute to the host response in P. aeruginosa keratitis; however, the requirement for TIRAP was only apparent in early, macrophage-dependent cytokine production, and activation of the TRIF pathway was only revealed in the absence of flagella. Given that TIRAP does not appear to regulate keratitis in vivo and that TLR5 is only involved in the presence of flagella, we next examined whether IL-1R1 regulates P. aeruginosa keratitis as this receptor signals through MyD88 in the absence of TIRAP (30), and IL-1α and IL-1β are produced during corneal infection. Corneas of C57BL/6 and IL-1R1−/− mice were infected with 19660 or 19660ΔfliC, and cytokine production, CFUs, corneal opacification, and cellular infiltration were examined as described above. As shown in Fig. 6A and 6B, CXCL1/KC and IL-1α production 3 h postinfection with 19660ΔfliC was significantly lower in IL-1R1−/− mice compared with C57BL/6. Conversely, CFUs were significantly higher in IL-1R1−/− mice compared with C57BL/6 mice infected with 19660ΔfliC (Fig. 6C) or 19660 (Fig. 6D). Corneal opacification and cellular infiltration to the corneal stroma were also lower compared with C57BL/6 mice (Fig. 6E). Role of IL-1R1, IL-1α, and IL-1β in P. aeruginosa keratitis. Corneas of C57BL/6 and IL-1R1−/− mice were abraded and infected with 1 × 103 19660 or 19660ΔfliC. CXCL1/KC (A) and IL-1α (B) production 3 h postinfection with 19660ΔfliC. C and D, CFUs 24 h postinfection with 19660ΔfliC (C) or 19660 (D). E, Representative eyes showing corneal opacification and cellular infiltration day 1 postinfection with 19660 (original magnification ×20 for corneas; ×400 for histology). F and G, CFUs from eyes of IL-1α−/−, IL-1β−/−, and IL-1α/β−/− mice days 1 or 2 postinfection with 19660. G, Representative eyes on day 2 postinfection (original magnification ×20). Data in A are mean ± SEM from five corneas per group, and data points in CFU graphs (C, D, F, G) represent individual eyes. These experiments were repeated three times with similar results. As IL-1α and IL-1β are produced during P. aeruginosa keratitis, we next infected mice deficient in IL-1 α, IL-1β, or both cytokines with parent strain19660, and CFUs were examined. As shown in Fig. 6F and 6G, CFUs recovered from IL-1R1−/− and IL-1α/β−/−, but not IL-1α−/− or IL-1β−/− mice, were significantly higher than C57BL/6 mice on days 1 and 2 postinfection. Similarly, IL-1α/β−/− corneas showed impaired cellular infiltration and decreased corneal opacification (Fig. 6H). 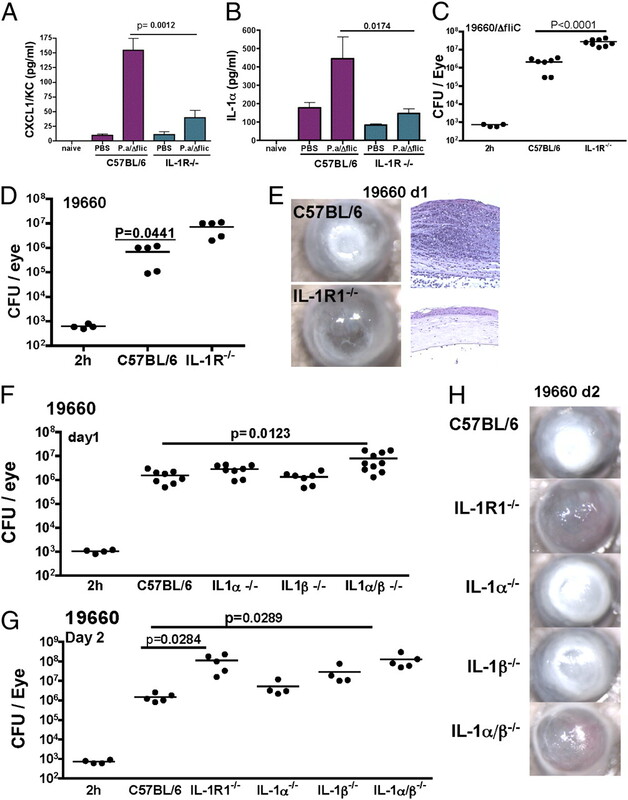 Taken together, these data show that either IL-1α or IL-1β can activate IL-1R1 in P. aeruginosa keratitis and that IL-1R1 has an essential role in regulating the inflammatory response to P. aeruginosa in the cornea. In addition, because there is no difference in response in mice infected with 19660 or 19660ΔfliC, these findings also indicate that IL-1α, IL-1β, and IL-1R1 function independently of flagellin/TLR5 responses. Although the normal mammalian cornea was long thought to be devoid of bone marrow-derived cells, a number of studies have shown that macrophages and dendritic cells are resident in this tissue, with macrophages being the predominant cell type in the corneal stroma (37–41). In the current study, we present several lines of evidence supporting the concept that resident bone marrow-derived cells and especially macrophages have an important role in regulating the outcome of corneal infection with P. aeruginosa. First, F4/80+ macrophages are the predominant cells in the corneal stroma that express surface TLR4 and TLR5 (and TLR2); second, depletion of macrophages results in impaired neutrophil infiltration and bacterial clearance; third, the absence of TLR4 on donor bone marrow-derived cells results in impaired cellular infiltration and bacterial killing; and fourth, macrophages incubated with P. aeruginosa stimulate TLR4/TIRAP/MyD88- and TLR4/TRIF-dependent NF-κB translocation and cytokine production. Taken together, these data are consistent with the sequence of events shown in Fig. 7 in which P. aeruginosa LPS and flagellin initiate the host response by activating TLR4/MD-2 and TLR5 on resident macrophages in the corneal stroma. 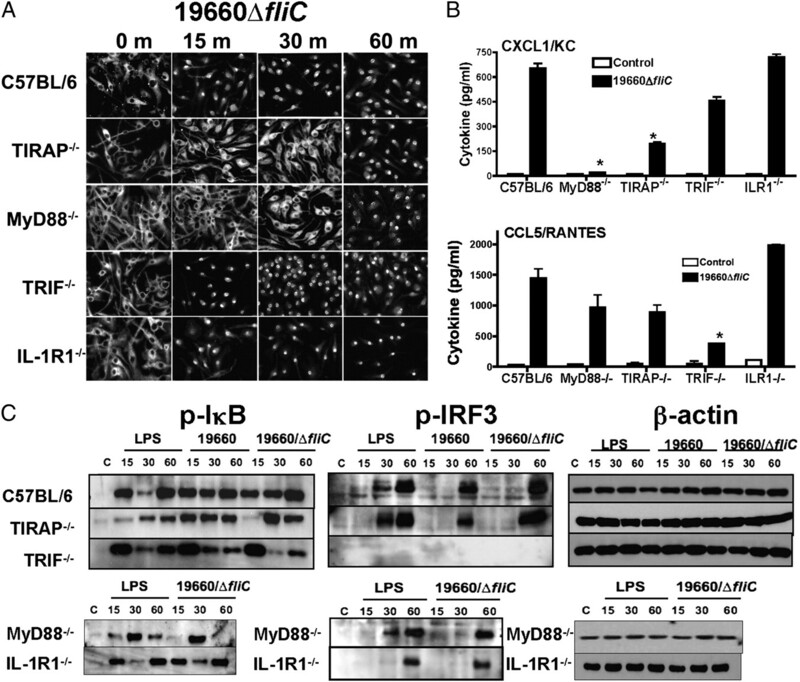 TLR5/MyD88, TLR4/MyD88 adaptor-like/TIRAP, and TLR4/TRIF signaling pathways all induce NF-κB translocation to the nucleus and transcription of proinflammatory and chemotactic cytokines. These include CXCL1/KC and probably CXCL2, 5, and 8, which recruit neutrophils from limbal capillaries to the corneal stroma, and IL-1α and IL-1β, which then feedback to activate the IL-1R1/MyD88 pathway in macrophages and most likely also in resident corneal epithelial cells and stromal fibroblasts. TLR5 on corneal epithelial cells may also contribute to the host response (13). Proposed sequence of events in P. aeruginosa keratitis. See text for details. Once in the corneal stroma, neutrophils actively phagocytose and kill P. aeruginosa; however, neutrophil degranulation and release of proteolytic enzymes and reactive oxygen species can cause extensive tissue damage as part of their likely role in digesting tissue to restrict bacterial dissemination (42). In the cornea, neutrophil degranulation induces apoptosis of resident keratocytes and corneal endothelium that regulate corneal transparency, resulting in loss of corneal clarity and visual impairment. The phenotype of immunocompetent mice is therefore early cytokine production, cellular recruitment to the corneal stroma, and control of bacterial replication. These mice exhibit early corneal opacification coincident with neutrophil and macrophage infiltration to the corneal stroma. Although these corneas develop pronounced opacification, they do not perforate. 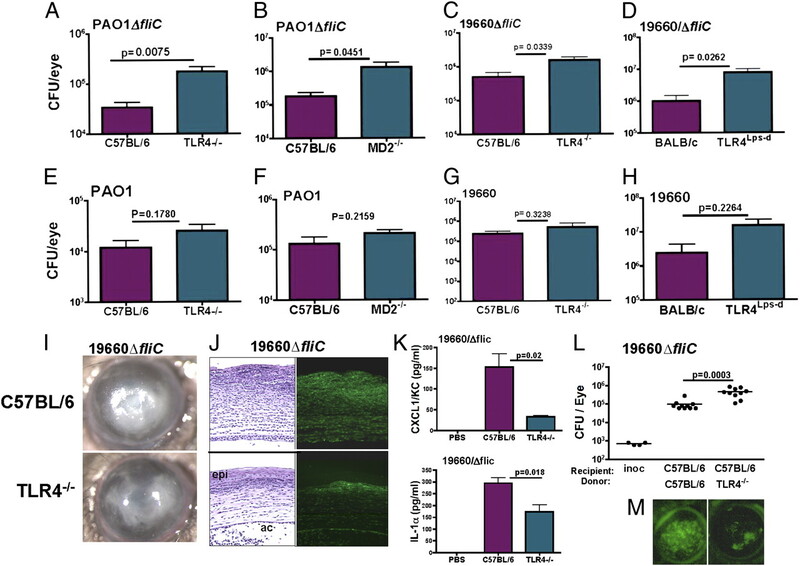 In contrast, blocking the TLR or IL-1R1 response at any of these stages results in delayed cellular infiltration (and corneal opacification), unimpaired bacterial growth, and corneal perforation. The results of our current studies are largely in agreement with those of Huang et al. (43), who reported a role for TLR4 in regulating P.aeruginosa keratitis. However, in contrast to our findings, these investigators reported a role for TLR4 in regulating growth of the parent 19660 strain. They also showed that cytokine production and neutrophil infiltration were elevated rather than inhibited (as shown in the current study) in TLR4lps-d mice and attributed impaired microbial killing to decreased expression of antimicrobial peptides (43). The discrepancy between those studies and data presented in this paper does not appear to be related to using TLR4lps-d mice on a BALB/c background (43, 44), because we found the same role for flagellin in TLR4lps-d mice. Also consistent with our findings, Hazlett and coworkers (45) used chlodronate-coated liposomes to deplete macrophages in the cornea and inhibited bacterial killing; however, that study also reported increased neutrophil infiltration to the cornea in the absence of macrophages, which is contrary to our observations. In addition to P. aeruginosa keratitis, our data are mostly in agreement with P. aeruginosa-induced pulmonary disease. These studies show that bacteria activate TLR4 and TLR5 on alveolar macrophages and lung epithelial cells (28), and that TLR4 and TLR5 regulate inflammation and growth of ΔfliC bacteria in the lungs (28, 46–48). Also consistent with our data, TIRAP−/− mice had impaired cytokine production in the lungs, but showed no difference in bacterial killing, whereas TRIF−/− mice had impaired cytokine production and bacterial killing although these studies used flagellate P.aeruginosa (49, 50). TIRAP−/− and TRIF−/− mice infected with the aflagellar bacteria Klebsiella pneumonia also have impaired cytokine production and are more susceptible to lung disease (49, 51–53). In examining the role of adaptor molecules in bone marrow-derived macrophages, we found that IRF3 phosphorylation was ablated in TRIF−/− macrophages, indicating direct activation of the TLR4/TRIF pathway by P. aeruginosa. Delayed translocation of NF-κB (60 min compared with 15 min for C57BL/6 macrophages) is consistent with the requirement for TLR4 internalization and localization to endosomal compartments, where TRIF and a fourth adaptor molecule, Toll/IL-1R intracellular domain-contain adaptor-inducing IFN-β–related adaptor molecule (TRAM), are recruited (54). Conversely, early Iκb phosphorylation and p65 translocation in TRIF−/− macrophages is likely due to TIRAP/MyD88 signaling. We therefore conclude from these and other studies (28) that P. aeruginosa activates NF-κB through the TLR4/TIRAP/MyD88 and the TLR4/TRAM/TRIF pathways. Given the role of these adaptor molecules in vitro, we anticipated that all of the adaptor molecules would regulate P. aeruginosa keratitis. However, we found that although TRIF and MyD88 had nonredundant roles, there was no effect of TIRAP deficiency on cellular infiltration or bacterial clearance, although TIRAP−/− mice had impaired early chemokine production. Because IL-1R1−/− mice have increased susceptibility to corneal infection with ΔfliC bacteria, it appears likely that IL-1R1/MyD88 signaling occurs in the absence of TIRAP. The apparent redundancy of TIRAP and IL-1R1 was also detected in vitro, where there was no impaired signaling in IL-1R1−/− macrophages. At this early time point (15 min after stimulation), the absence of an observed role for IL-1R1/MyD88 is likely due to TLR4/TIRAP/MyD88 signaling. Given the important role for IL-1R1 in P. aeruginosa keratitis, we also examined the relative contribution of IL-1α and IL-1β during infection and found that IL-1α/β−/− mice but not single gene knockout mice had a similar phenotype as IL-1R1−/− mice, indicating that both IL-1α and IL-1β contribute to the inflammatory response. Hazlett and colleagues (55) showed that IL-1β is the predominant isoform in P. aeruginosa keratitis and that caspase-1−/− mice have decreased neutrophil infiltration (56). This is consistent with reported activation of the Ipaf inflammasome by P. aeruginosa flagellin (57, 58). Although the current study has focused on the role of proinflammatory and chemotactic cytokines in regulating P. aeruginosa keratitis, it is clear that other pathways are also involved. Expression of antimicrobial peptides, including β defensins, are elevated in corneal epithelial cells and in vivo (59, 60). Furthermore, pretreatment of corneas with isolated flagellin inhibits P. aeruginosa keratitis by stimulating production of antimicrobial peptides, such as cathelicidin (61, 62). In addition, expression of the cystic fibrosis transmembrane conductance regulator on corneal epithelial cells is required for P. aeruginosa entry into these cells and for development of keratitis (63). A recent study showed that P. aeruginosa infection of mice deficient in macrophage migratory inhibition factor have impaired cytokine production and neutrophil infiltration to the cornea, although MIF-/- mice also show enhanced bacterial clearance (64). The role of T cell responses in P. aeruginosa keratitis has also been extensively characterized (65). Although further studies are required to generate a more comprehensive understanding of how these host responses interact to regulate bacterial replication and development of disease, our studies clearly implicate TLR/IL-1R1 signaling in the early stages of corneal infection. We thank Cathy Doller, Rui Zhang, Sherri Morgan, and Haowen Ge for technical assistance and Sixto Leal for many discussions and critical review of the manuscript. This work was supported by National Institutes of Health Grants R01 EY14362 (to E.P. ), P30 EY11373 (to E.P. ), and DE14924 (to Y.H.) and American Cancer Society Research Scholar Grant RSG-09-198-01-MPC (to A.R.). Additional support for this work was provided by the Research to Prevent Blindness Foundation and the Ohio Lions Eye Research Foundation. Toll/IL-R intracellular domain-containing adaptor inducing IFN-β.
. 2008. Comparison of virulence factors in Pseudomonas aeruginosa strains isolated from contact lens- and non-contact lens-related keratitis. J. Med. Microbiol. 57: 1539–1546.
. 2008. Risk factors and causative organisms in microbial keratitis. Cornea 27: 22–27.
. 2008. The clinical and cellular basis of contact lens-related corneal infections: a review. Clin. Ophthalmol. 2: 907–917.
. 2010. The impact of inoculation parameters on the pathogenesis of contact lens-related infectious keratitis. Invest. Ophthalmol. Vis. Sci. 51: 3100–3106.
. 2003. Contribution of ExsA-regulated factors to corneal infection by cytotoxic and invasive Pseudomonas aeruginosa in a murine scarification model. Invest. Ophthalmol. Vis. Sci. 44: 3892–3898.
. 2003. Role of Pseudomonas aeruginosa ExsA in penetration through corneal epithelium in a novel in vivo model. Invest. Ophthalmol. Vis. Sci. 44: 5220–5227.
. 2007. Mutation of the phospholipase catalytic domain of the Pseudomonas aeruginosa cytotoxin ExoU abolishes colonization promoting activity and reduces corneal disease severity. Exp. Eye Res. 85: 799–805.
. 2005. Activation of toll-like receptor (TLR)2, TLR4, and TLR9 in the mammalian cornea induces MyD88-dependent corneal inflammation. Invest. Ophthalmol. Vis. Sci. 46: 589–595.
. 2008. MyD88 functions as a negative regulator of TLR3/TRIF-induced corneal inflammation by inhibiting activation of c-Jun N-terminal kinase. J. Biol. Chem. 283: 3988–3996.
. 2002. Regulation of endotoxin-induced keratitis by PECAM-1, MIP-2, and Toll-like receptor 4. Invest. Ophthalmol. Vis. Sci. 43: 2278–2284.
. 2008. Toll-like receptors at the ocular surface. Ocul. Surf. 6: 108–116.
. 2006. Toll-like receptors and the eye. Invest. Ophthalmol. Vis. Sci. 47: 1255–1263.
. 2003. Toll-like receptor 5-mediated corneal epithelial inflammatory responses to Pseudomonas aeruginosa flagellin. Invest. Ophthalmol. Vis. Sci. 44: 4247–4254.
. 2001. The expression of functional LPS receptor proteins CD14 and Toll-like receptor 4 in human corneal cells. Invest. Ophthalmol. Vis. Sci. 42: 2867–2877.
. 2004. Intracellularly expressed TLR2s and TLR4s contribution to an immunosilent environment at the ocular mucosal epithelium. J. Immunol. 173: 3337–3347.
. 2008. c-Jun NH2 terminal kinase (JNK) is an essential mediator of Toll-like receptor 2-induced corneal inflammation. J. Leukoc. Biol. 83: 991–997.
. 2009. Bone marrow chimeras and c-fms conditional ablation (Mafia) mice reveal an essential role for resident myeloid cells in lipopolysaccharide/TLR4-induced corneal inflammation. J. Immunol. 182: 2738–2744.
. 1998. Different strains of Pseudomonas aeruginosa isolated from ocular infections or inflammation display distinct corneal pathologies in an animal model. Curr. Eye Res. 17: 730–735.
. 2005. ExsE, a secreted regulator of type III secretion genes in Pseudomonas aeruginosa. Proc. Natl. Acad. Sci. USA 102: 8006–8011.
. 1997. Splicing by overlap extension by PCR using asymmetric amplification: an improved technique for the generation of hybrid proteins of immunological interest. Gene 186: 29–35.
. 2004. Conditional macrophage ablation in transgenic mice expressing a Fas-based suicide gene. J. Leukoc. Biol. 75: 612–623.
. 2006. Development of peritoneal adhesions in macrophage depleted mice. J. Surg. Res. 131: 296–301.
. 2006. Visualization and characterization of inflammatory cell recruitment and migration through the corneal stroma in endotoxin-induced keratitis. Invest. Ophthalmol. Vis. Sci. 47: 241–248.
. 2009. Inhibition of corneal inflammation by the TLR4 antagonist Eritoran tetrasodium (E5564). Invest. Ophthalmol. Vis. Sci. 50: 1247–1254.
. 2007. CXCL1/KC and CXCL5/LIX are selectively produced by corneal fibroblasts and mediate neutrophil infiltration to the corneal stroma in LPS keratitis. J. Leukoc. Biol. 81: 786–792.
. 2001. Mal (MyD88-adapter-like) is required for Toll-like receptor-4 signal transduction. Nature 413: 78–83.
. 2002. The adaptor molecule TIRAP provides signalling specificity for Toll-like receptors. Nature 420: 329–333.
. 2001. TIRAP: an adapter molecule in the Toll signaling pathway. Nat. Immunol. 2: 835–841.
. 2004. The induction of macrophage gene expression by LPS predominantly utilizes Myd88-independent signaling cascades. Physiol. Genomics 19: 319–330.
. 2003. LPS-TLR4 signaling to IRF-3/7 and NF-κB involves the Toll adapters TRAM and TRIF. J. Exp. Med. 198: 1043–1055.
. 2002. Identification of a novel macrophage population in the normal mouse corneal stroma. Invest. Ophthalmol. Vis. Sci. 43: 2264–2271.
. 2007. The chemokine receptor CX3CR1 mediates homing of MHC class II-positive cells to the normal mouse corneal epithelium. Invest. Ophthalmol. Vis. Sci. 48: 1568–1574.
. 2003. Corneal immunity is mediated by heterogeneous population of antigen-presenting cells. J. Leukoc. Biol. 74: 172–178.
. 2005. CD34+ corneal stromal cells are bone marrow-derived and express hemopoietic stem cell markers. Stem Cells 23: 507–515.
. 2005. Characterization and distribution of bone marrow-derived cells in mouse cornea. Invest. Ophthalmol. Vis. Sci. 46: 497–503.
. 2006. TLR4 is required for host resistance in Pseudomonas aeruginosa keratitis. Invest. Ophthalmol. Vis. Sci. 47: 4910–4916.
. 2000. Increased severity of Pseudomonas aeruginosa corneal infection in strains of mice designated as Th1 versus Th2 responsive. Invest. Ophthalmol. Vis. Sci. 41: 805–810.
. 2003. Macrophages restrict Pseudomonas aeruginosa growth, regulate polymorphonuclear neutrophil influx, and balance pro- and anti-inflammatory cytokines in BALB/c mice. J. Immunol. 170: 5219–5227.
. 2008. Control of Pseudomonas aeruginosa in the lung requires the recognition of either lipopolysaccharide or flagellin. J. Immunol. 181: 586–592.
. 2005. An essential role for non-bone marrow-derived cells in control of Pseudomonas aeruginosa pneumonia. Am. J. Respir. Cell Mol. Biol. 33: 470–475.
. 2006. Toll/IL-1R domain-containing adaptor protein (TIRAP) is a critical mediator of antibacterial defense in the lung against Klebsiella pneumoniae but not Pseudomonas aeruginosa. J. Immunol. 177: 538–547.
. 2007. A role of Toll-IL-1 receptor domain-containing adaptor-inducing IFN-β in the host response to Pseudomonas aeruginosa lung infection in mice. J. Immunol. 178: 3170–3176.
. 2005. Toll-IL-1 receptor domain-containing adaptor protein is critical for early lung immune responses against Escherichia coli lipopolysaccharide and viable Escherichia coli. J. Immunol. 175: 7484–7495.
. 2009. Both TRIF- and MyD88-dependent signaling contribute to host defense against pulmonary Klebsiella infection. J. Immunol. 183: 6629–6638.
. 2007. Toll/IL-1 receptor domain-containing adaptor inducing IFN-β (TRIF)-mediated signaling contributes to innate immune responses in the lung during Escherichia coli pneumonia. J. Immunol. 178: 3153–3160.
. 2000. Prolonged elevation of IL-1 in Pseudomonas aeruginosa ocular infection regulates macrophage-inflammatory protein-2 production, polymorphonuclear neutrophil persistence, and corneal perforation. J. Immunol. 164: 6576–6582.
. 2004. Regulation of Pseudomonas aeruginosa corneal infection in IL-1β converting enzyme (ICE, caspase-1) deficient mice. Curr. Eye Res. 29: 225–233.
. 2009. β-Defensin-2 promotes resistance against infection with P. aeruginosa. J. Immunol. 182: 1609–1616.
. 2007. Ocular surface expression and in vitro activity of antimicrobial peptides. Curr. Eye Res. 32: 595–609.
. 2008. Flagellin suppresses the inflammatory response and enhances bacterial clearance in a murine model of Pseudomonas aeruginosa keratitis. Infect. Immun. 76: 89–96.
. 2007. Modulation of corneal epithelial innate immune response to Pseudomonas infection by flagellin pretreatment. Invest. Ophthalmol. Vis. Sci. 48: 4664–4670.
. 2008. Disruption of CFTR-dependent lipid rafts reduces bacterial levels and corneal disease in a murine model of Pseudomonas aeruginosa keratitis. Invest. Ophthalmol. Vis. Sci. 49: 1000–1009.
. 2010. Inhibition of macrophage migration inhibitory factor ameliorates ocular Pseudomonas aeruginosa-induced keratitis. PLoS Pathog. 6: e1000826. 2004. Corneal response to Pseudomonas aeruginosa infection. Prog. Retin. Eye Res. 23: 1–30.